The Santa Clara Transit Center station will form the terminus of Bay Area Rapid Transit (BART) extension to Silicon Valley, and is currently served by Caltrain, Altamont Commuter Express (ACE) and Capitol Corridor rail lines. An Automated People Mover system will connect to San José International Airport Transit Center. 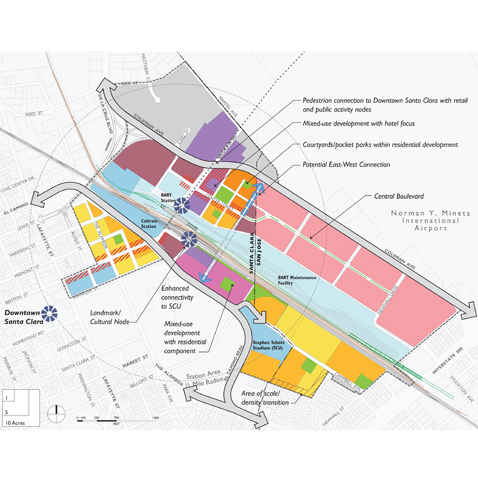 The Station Area Plan encompasses planning for 440 acres of land extending into the cities of Santa Clara and San José that are currently largely occupied by older industrial uses, several of them no longer operational. It lays the foundation for transforming the area into a dynamic environment with new mixed-use residential neighborhoods and high-intensity employment uses. Over 2,200 new residential units are proposed within walking distance of the transit station, accommodating 6,200 residents, and five million square feet of new office, hotels, and retail space. Uses are carefully orchestrated to capitalize on accessibility to transit, while ensuring compatibility and fit with airport impact zones, and noise from rail operations, as well as the historic Old Quad neighborhood. 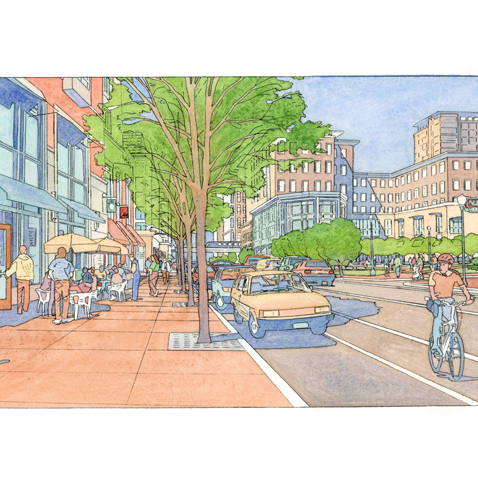 The Plan includes new street network through the large industrial blocks; a new “Main Street,” and residential, commercial, and mixed-use neighborhoods, and improved connections. 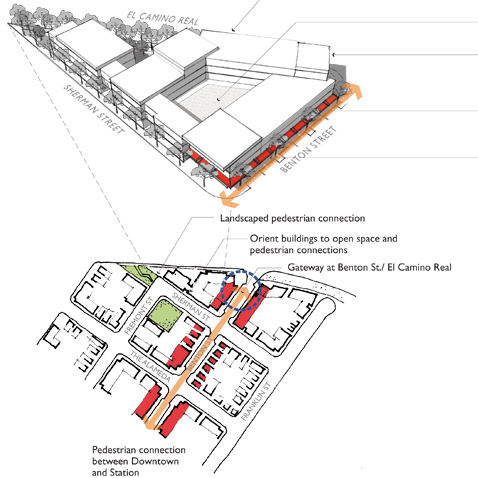 The Plan has been integrated in its entirety into the Santa Clara General Plan, which was adopted in November 2010, and is being carried out through specific Planned Development and General Plan amendments for the City of San José. In addition, the redesign of the BART station campus is being implemented by VTA, which will ensure greater station accessibility, more efficient parking, and use of remaining VTA-owned property by active non-parking uses.